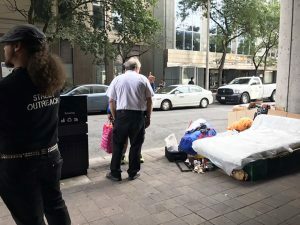 Several homeless people who had settled at the entrance of Victoria Street’s Tim Hortons were evicted Wednesday morning by the City of Toronto. 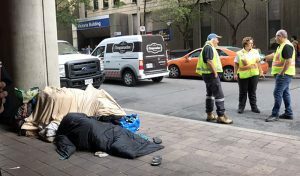 Homeless people have been congregating on the edge of the sidewalk in front of the Tim Hortons for years, said a longtime member of the Ryerson Security team. Recently, a tent was put up there, as well as a makeshift milk-crate platform bed. 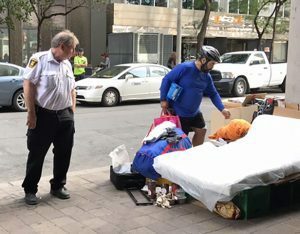 Members of a city of Toronto street outreach team were on hand to assist in the clearance of their belongings and to offer services, should they choose to accept. Members of the City of Toronto’s outreach group pack up belongings. Patricia Anderson, manager at Shelter, Support, and Housing Administration with the city, said that Streets to Homes (S2H) is there to ensure there’s a balance of offering services to people, while still making sure areas are not being obstructed. “Anytime there is a clearing of an encampment, S2H are advised to make sure they’re not clearing away without providing social support,” Anderson said. It wasn’t immediately known how many people were moved from the sidewalk, but one person is working with S2H on a housing plan, the rest are not interested. Jason Serroul, said he wouldn’t go. Serroul, from Nova Scotia, said he has been living on Toronto streets for the last 12 to 13 years. His belongings were piled high on the sidewalk where he was sleeping when the S2H outreach team arrived. He said he was there because interacting with people at the Tim Hortons is good for his mental stability. Opening the door for people is his way of taking care of them, he said. Serroul said he is familiar with the members of the outreach team, who keep in touch with members of the homeless community. But he said the solutions they offer aren’t what he’s looking for. “Anybody else that is newer in Toronto and hitting the street I would wish them well with such things, they should take advantage of [Streets to Homes]… They do have similar things in every province. But we’re all different,” Serroul said. While Tanya Poppleton, Manager of Security and Emergency Services at Ryerson said that “Victoria Street is the City of Toronto’s property, that space is under their purview,” it’s in the middle of the Ryerson campus and is usually packed with students. And one well-known outreach worker says that connection between Ryerson and what is happening on the streets means the university has a responsibility to help deal with the issues. Street nurse Cathy Crowe, who focuses on health issues affecting homeless people, said that the Ryerson community needs to address what is visible near campus. Crowe said she doesn’t think that academic institutions have been aligning themselves with organizations to prevent poverty and homelessness. “We’re part of a global city. There aren’t borders around us that shelter us,” Crowe said. Crowe said that it’s an issue for students too, since they sometimes become homeless and develop addictions. In December 2013, a homeless man named Richard Kenyon died outside of the Mattamy Athletic Centre. In September 2014, a homeless man identified only as John Doe was run over by a garbage truck on O’Keefe Lane. A few months later, in January, a homeless man by the name of Sergio was found dead in a bus shelter at Yonge and Dundas Streets in -14 C weather. “Ryerson is situated in the middle of this horrific crisis, and blinks,” said Crowe, who is also a distinguished visiting practitioner at Ryerson. “There may be a need to repeat the clearance procedure, as apparently one person has returned,” said Anderson on Thursday. Correction: An earlier version of this story incorrectly identified Cathy Crowe. Julie, I’m surprised you described me as “Cathy Crowe, who is known as the “street nurse” because of her focus on health issues affecting homeless people, said that the Ryerson community needs to address what is visible near campus.” I am a Street Nurse and have been for 30 years. Why in quotation marks? It’s my profession. I’m also a DVP at Ryerson in Department of Politics. My name is Rita,I follow under the low income bracket,but yet somehow manage to help and feed the homeless with or without my 8 yr old grandson.Whether it’s peanut butter and jam sandwiches or cold cuts and cheese,every little bit helps.Spreading awareness regarding helping the homeless and hungry.That could be us homeless.This is a crisis in our city and of course world wide.Even our Mayor does not get it,I met him at the Taste Of The Danforth,and asked him if he would like to come with my grandson and I to feed the homeless his response was”I would love to.”His assistant has not responded back yo e-mails or phone calls.That’s pretty sad,how do you explain that to a 9 yr old?If anyone wants to call me feel free to do so,at 416-921-6718.My mission is to help the homeless,hungry and vulunerable,and to teach my grandson a huge life lesson,I know he will carry on my legacy when he gets older.Thank-you hope to hear from you soon,by the way since I read this about the city evicting these poor homeless people at Tim Hortons, I will go down there this morning and pass out some sandwiches and water,and you know why?Because I care.